Posted on 16/02/2011 at 02:18 PM. Just thought I'd let all you guys know that it's on again this year. April 9th and 10th. with briefing on the 8th. 7pm. We'll also have the dinner on the Saturday night with the venue TBA. Entry is $35 per angler and teams of 2 anglers. The word "tournament" is a bit loose. 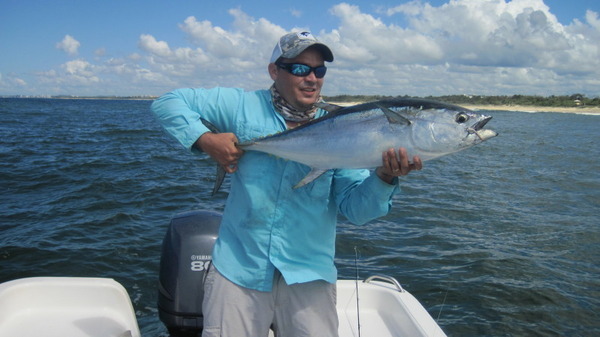 Basically we look at it as a weekend to all get together and have some fun and catch a few Longtails and Macs and to help promote this special rec.fishery. The macs are already about in numbers and there is stacks of bait so it's just a matter of time before the longies turn up in numbers. March/April/May are traditionally our best months for chasing these speedsters on the Sunny Coast. We'd love to see some of you guys. If interested contact Snow @ TienFly Outfitters on 07-54440611. Posted on 17/02/2011 at 07:23 AM. For anyone thinking of going, this is a really fun weekend. Low key, well run and a very decent bunch of blokes. And the fishing was grrrrreat last year. Posted on 14/04/2011 at 11:56 AM. Just thought I'd post a follow up as to how things went over the week-end. Carl Bernard (Snow) has drafted this report so I'll put it up word for word from Snow.
" This year the threat of bad weather once again played it's hand in regards to participating numbers however a big thanks to the 20 competitors for taking part in this anual event. Competitors came from as far north as Hervey Bay and as far south as the Gold Coast. 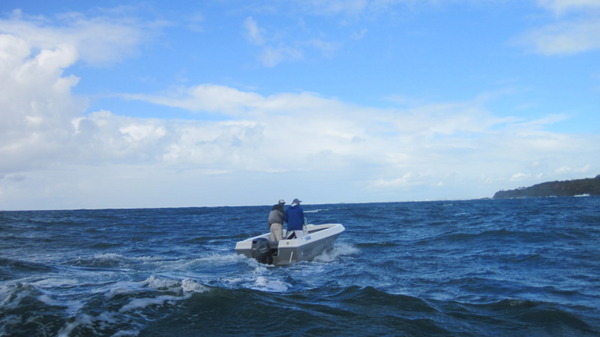 Saturday saw predicted winds of 15-20 knots and messy seas which made conditions for the day tough to fish--Andy Vockler and Kim Strathern were the only anglers to boat Longtails for the day. However Sunday saw conditions improve with the sea settling down and the winds dropping back to 10 knots. These conditions had a positive effect on the fish and north around Coolum they were feeding hard for the best part of the morning. 15 longtails to 15kg. 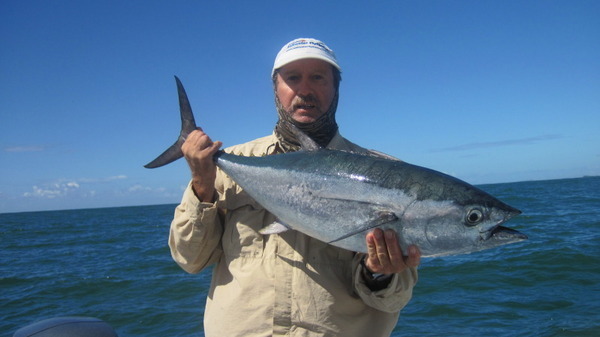 and 2 mack tuna to 8kg. were boated(and released) for the day. I would like to thank Joe de Jagger and his wife Christa for once again feeding hungry and somewhat weather beaten fisho's on the Saturday night at the Mooloolaba Yacht Club where all competitors gathered for a few beers and general discussion on the day's events. A special mention also to Bridget Taylor who once again flew the flag for the female competitors and also scoring a sloid Mack Tuna of 8kg.--well done Bridget and hopefully we can get some more ladys to compete next year. CHAMPION TEAM--------Geoff Volter and Km Strathern--9 Longtails. I would also like to thank the evnt sponsors being Tie'n' Fly Outfitters , Brack Software Solutions, Gail Heidemann Laser Engraving and Frank Redpath Accounting. Posted on 14/04/2011 at 11:57 AM. Posted on 14/04/2011 at 12:01 PM. Posted on 15/04/2011 at 12:41 PM. Posted on 16/04/2011 at 01:13 PM.